Made from the finest quality 18/10 stainless steel, this coordinated range is designed for cooking without the addition of fat or water, resulting in a much healthier way of eating. 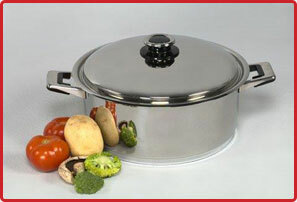 Vegetables are cooked by placing them dripping wet into a pot and then onto the stove plate at a medium setting. When a little steam escapes the heat is turned to low allowing the food to cook in its own juices. Meat is cooked in a similar way with the pot pre-heated and the meat sealed on both sides. No fats or oils are used. When you lift the lid you'll find the colour, texture and flavour of the food noticeably improved as the moisture and nutrients have been retained. Your meat will retain all its natural tastes, shrink less and be more tender. 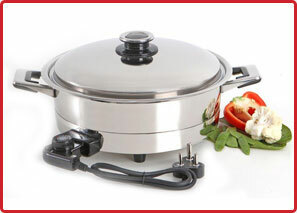 You can also use these pots for conventional cooking, steaming, baking cakes, roasting and stir-frying. All cooking is done at low temperature, reducing your power bills. In fact this cookware soon pays for itself with savings in fuel, the need for less seasoning and using less expensive cuts of meat. Most importantly, you'll be cooking and eating more healthily - what is it worth to you? We hereby guarantee that our product is manufactured from high quality 18/10 Chrome Nickel Stainless Steel and that all other materials used are rustproof and of highest quality. We also guarantee that we will replace (or repair where applicable) any unit found to be defective due to faulty workmanship and/or material, provided that the unit has not been damaged by misuse or carelessness. This guarantee is valid during the lifetime of the purchaser and is not transferable. The bakelite components are not covered by this guarantee. The guarantee on electrical components is limited to TWO YEARS from the date of receipt of the unit.